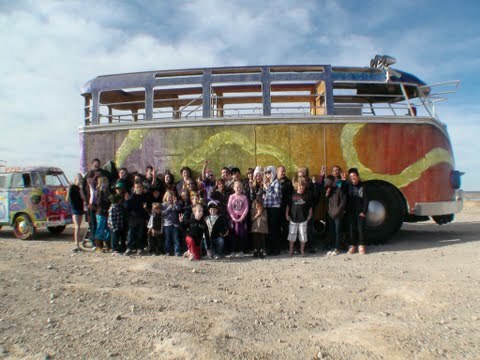 It was that time of year again this past weekend and Walter and the Tribe tore it down right proper with all the most excellent folk who attended Buses By the Bridge again. We pulled into town on the redeye due to “Oversize Load” curfews that had us leaving Scottsdale at 530AM. We set up camp with the few other Buses as the BBB staff set up their stage. By Friday evening we were celebrating with the kids and kids-at-heart as the music jammed and dance party grooved. For the most part the day was serene and full of great conversation with old friends as we tipped back a few on the blissful shores of Lake Havasu. 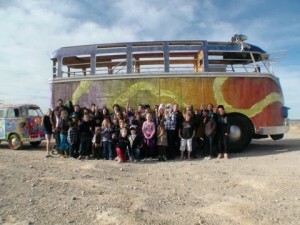 On Saturday the energy picked up as more buses arrived and wackiness kicked into gear. For the morning, Walter chilled out as all the well wishers stopped by and chilled on his upper bamboo deck in the warming sun. Music was played through Walter’s 50 speakers by DJ Stormy and the Light Boyz Brigade worked the lights to superb effect so that the dancers felt they were in a club by the bay. Security Grrrlz kept all the visitors safe and generally looked after Walter’s well-being. As Walter handed out 50 pounds of rare Chinese coins, the Tribe walked the grounds, chatting with all dynamite owners of the VW buses – we picked up some ultra-unique necklaces, some cool vintage VW bug toy cars, a few vintage postcards of VW’s in action, and just some undeniably great Karma from all the super-cool people. Seeing some of you wearing your Walter shirts just blew our minds and made our cheeks ache with smiles that could not be stymied. Around 9PM when the raffle ended, Darkness Dear Boy took the stage…or the ladders, and jammed for nearly two hours. We received dozens of compliments from all the dancers and watchers who rocked out. There are video and pictures, so we’ll work on getting links to those. After that, it was chill time as Walter chilled by the fire for some great conversation into the wee hours of the evening. Sunday morning saw us enjoying some amazing blueberry and banana pancakes a-la-Ricky, and then…THE BRIDGE KIDDO BUS TOUR! We had a full load of over 50 (FIDDY!) of BBB’s younger campers that we took over the London Bridge as the town honked and waved (as did Walter). It was such a great time, Walter wanted to thank you all for making him feel at home up in Havasu. Next up, Prada Del Sol! See all you great BBB folk next year.